Just received the new National Geographic Kids Pleybox! 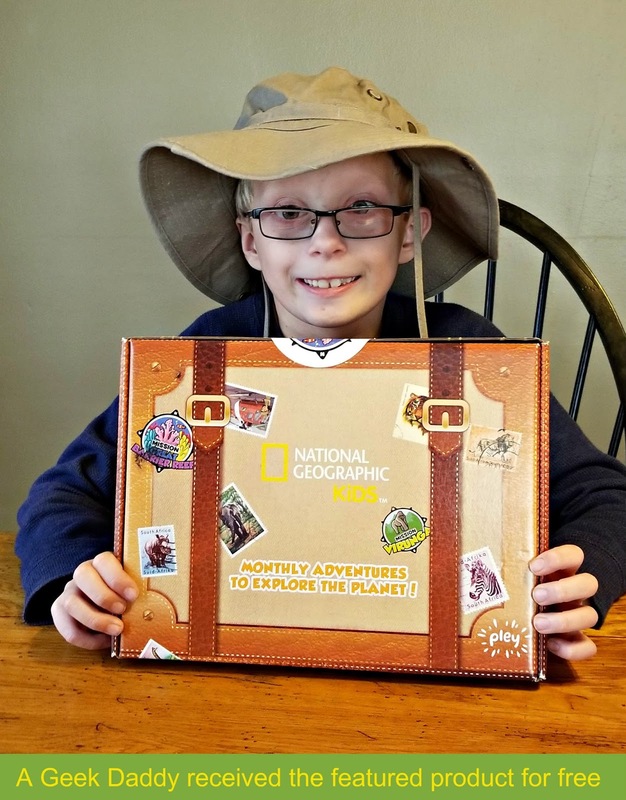 Pley subscription services have partnered with National Geographic Kids to create a program that delivers environmentally themed adventure packages for kids that are both educational and entertaining right to your doorstep. 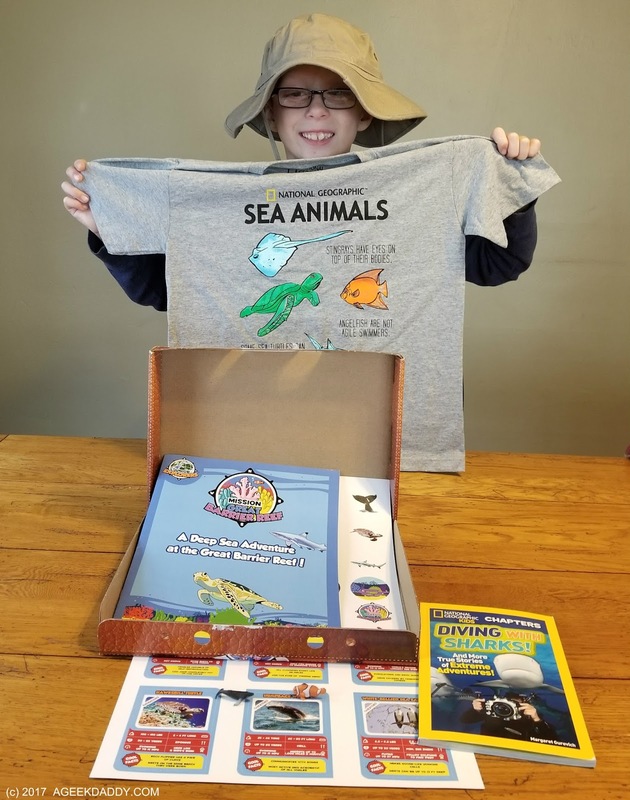 Each month a National Geographic Kids Pleybox arrives in the mail themed upon a different part of the world with boxes themed around places including the Arctic, Amazon, and Everglades. You can order just one box individually or set-up a three month or six month subscription of deliveries. National Geographic Kids Pleyboxes are ideal for children ages 5 to 11. Each Pleybox is filled with curated activities and accessories that introduce recipients to the animals and habitats of different locals. The one that just arrived at our home features Australia's Great Barrier Reef. So what is inside the box?! 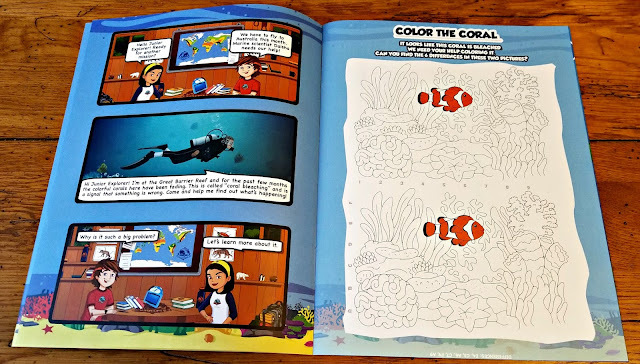 A Deep Sea Adventure at the Great Barrier Reef activity book that includes information on the creatures that inhabit this ecosystem along with along with coloring pages, puzzles and games. Trading Cards with interesting facts about blacktip reef sharks, clownfish, hawksbill turtles, and humpback whales. Sticker Sheet themed around the Great Barrier Reef. Two small figurines --> A clownfish and humpback whale. A National Geographic Kids book about SHARKS! Video game code that allows your family to access online digital games. 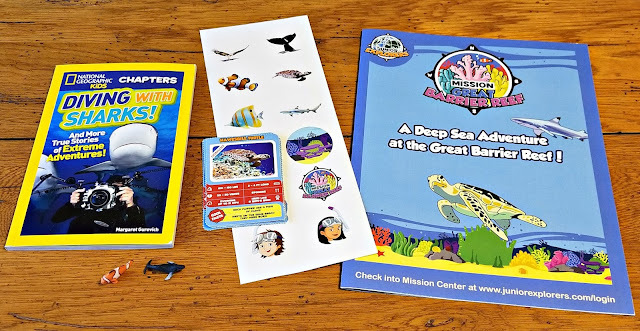 There are five Great Barrier Reef inspired games to play with my kids favorites being the Fish & Snake Catch and The Scooter Trail. In Fish & Snake Catch players need to help a White-Bellied Sea Eagle fly through a course while catching fish and sea snakes to eat. Avoid obstacles as you make your way through a coral reef on a boat in The Scooter Trail. Other online activities accessible through this Pleybox include a What's the Animal guessing game and a digital jigsaw puzzle to complete. T-shirt with a variety of sea creatures you'd find at the Great Barrier Reef pictured on it. This National Geographic Kids Pleybox was great for keeping my kids amused on a cold winter day when the temperatures outside were sub-zero and they were home from school for Christmas break. It transported them to a warm far off place ... at least in their imaginations! Plus, what kid isn't excited to get something in the mail? That curiosity and excitement of discovering something new left for them in the mailbox was a great way to capture their attention while having fun learning some educational things too about the Great Barrier Reef. For more information about National Geographic Kids Pleyboxes, head over to pley.com/national-geographic. The contents of these boxes have an estimated retail value of $50 but you can get them for $19.99 + shipping & handling for one box or even less per box if you purchase a multi-month subscription package.